Update: Please pardon our mess. The “Maps + Schedules” tab seems to have taken a day off. We’re making surgical updates to get the data working again. Thank you so much to everyone who’s been providing feedback and beta-testing the new website. Maps and Schedules has been completely revamped! We’ve updated the design and layout to show the information you need most on both mobile and desktop. 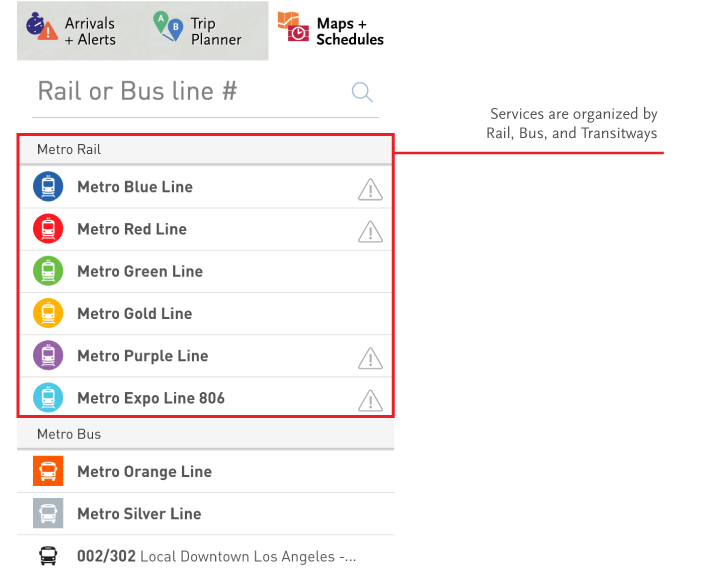 When you click on Maps and Schedules you can search for your bus and/or train line and you will now see all the services organized by Rail, Bus and Transitways. 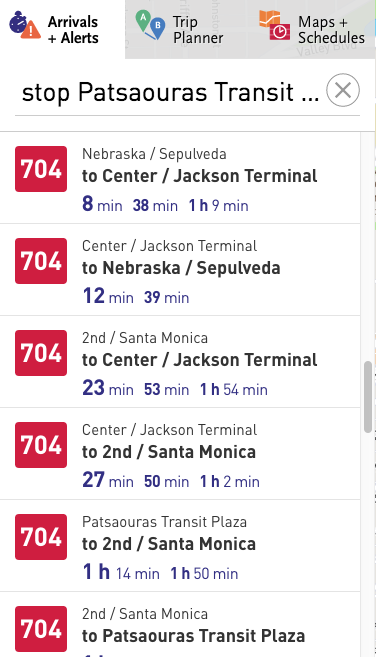 Clicking on a rail or bus line will display all the stops on that line. The timetable icon will allow you to download the entire timetable for that given line. The direction switcher will allow you to reverse the direction of the selected rail or bus line with a single click. Trip Planner live data: We have incorporated LAX FlyAway data and will continue to incorporate data from all of our partners throughout L.A. County. This will help ensure the Trip Planner gives the most efficient route. Improve overall speed and uptime of the site and the ridership tabs. We have also completed a redesign of Arrivals and Alerts! Our goal is the make rail and bus arrivals clear. Lines are organized by number and then by earliest arrival. 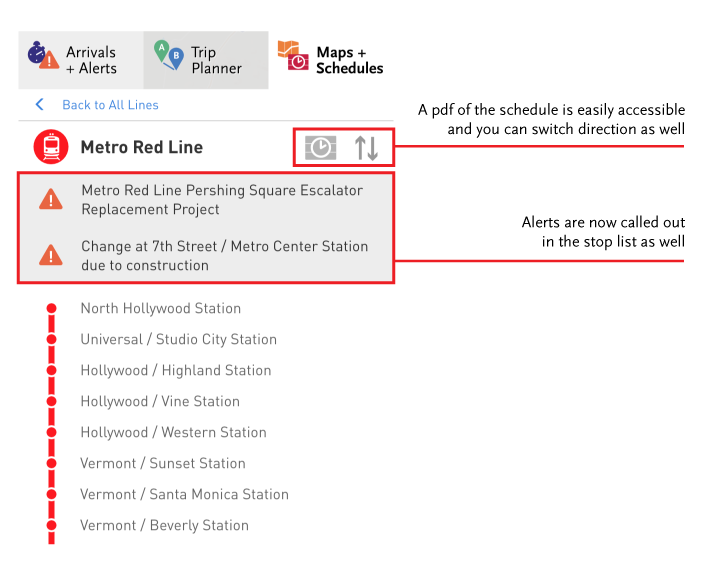 Alerts along bus and rail lines will appear on the map. We will continue to work on optimizing ‘Arrivals and Alerts’ over the coming weeks. Look for future updates to this tab in our next release! Arrivals and Alerts will display alerts on the map based on your location. We’ll also continue to work on organizing the content displayed in all ridership tabs. Stay tuned and thank you for continuing to ride with us. The beta site is a big improvement, I’m a big fan. When standing at a stop, the only question I really ever have is “When is the next train [or bus] coming?” and this layout seems to make that simpler. This leads to a sort of natural question about the “next arrivals”: Do they reflect only scheduled times or both tracked trains and scheduled trains? From the perspective of a rider deciding whether or not to trust the numbers the difference can be meaningful. Arrivals labeled with a “->” are “tracked”, and even have a run number. I know they are real, and will be coming eventually. Trains marked with a “*” are “scheduled” and are therefore treated with due skepticism.